I have come across an interesting case recently. A mondain breeder called me because one of his hens was unable to lay the egg that was palpable just before the cloaca. He tried to lubricate the cloaca by administering some paraffin oil in it but it did not help. The hen was a valuable breeder so, he wanted to know if a surgical solution was an option. Unfortunately, I was out of town and did not expect to get back before late night. So, the breeder took the hen to a colleague but the following day I would see him in my surgery. Until then, let me explain briefly the disorder that is called egg retention. 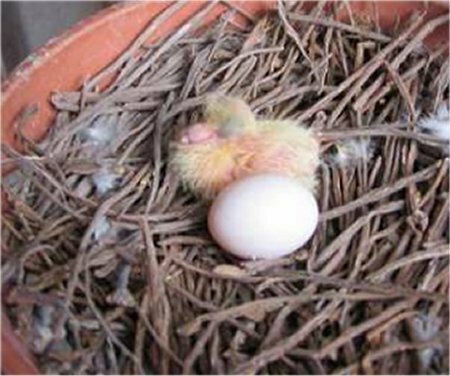 It is a relatively common disorder in birds when hens are not able to lay the fully developed egg. In most cases larger than average size eggs cause this disorder. Such an “absolute” oversize egg cannot pass through the distal part of the oviduct or through the cloaca. We call the egg “relatively” oversized when it is not really larger than average but the oviduct or the cloaca is too tight to let it go through. Such a tight oviduct can be a result of a previous inflammation or injury. During the healing process scars make the oviduct shrunk and rigid. Anatomic abnormalities of genetic origin or weak oviduct wall may also be causes of egg retention. Whatever the cause is, the value of a stock bird is determined, in part, by its capability to pass its excellent genetic constitution on to the offspring. The excellent genetic constitution itself is useless from the breeder’s point of view if the hen has difficulties in reproduction, namely, in egg formation, laying the eggs or in rearing the youngsters. Breeding such hens cannot be justified because these disorders are usually passed on to the descendants. From the breeder’s perspective especially destructive are those disorders that are encoded by recessive genes and thus, inherited in a latent manner. Such hereditary disorders may remain unnoticed in a flock for a long time while the number of birds carrying the defected gene silently increases. Then, when the affected gene reaches a certain percentage in the flock, it suddenly manifests itself. It means that the disorder caused by the affected gene comes to the surface quasi as an outbreak. This can happen in the case of egg retention, too if it is of genetic origin. Often, in such cases the only option is complete replacement of the breeders. Therefore, immediate exclusion of birds from breeding that are suspected to carry the affected gene is highly recommended. Now, let’s get back to the client who decided to have his bird x-rayed in my colleague’s surgery. The film, however, did not give a good diagnostic hint (we’ll se later why). It was not clear if the egg was on the picture at all because the object did not give such a contrast as a calcified organ (like bone or egg) was expected to do. Finally, the owner did not take the risk and the cost of an operation, and the bird was put down. The following day he brought the bird in to my surgery for a dissection. The external examination revealed a palpable object before the cloaca that was larger than an average size mondain egg. However, it felt dens and elastic much more resembling a tumor than an egg. As I curiously opened the abdomen, it turned out that the object was located in the distal part of the oviduct. So, it was an egg, indeed. When I cut through the uterus wall, a really large egg became visible which, however, did not have a calcified shell. (That was the reason why it did not give a visible contrast on the x-ray film.) After I took it out and cut it in half, another surprise occurred: the inner part of the egg did not show the classic picture at all as it did not contain liquid white and yolk. Instead, a layered, elastically dens material filled it. 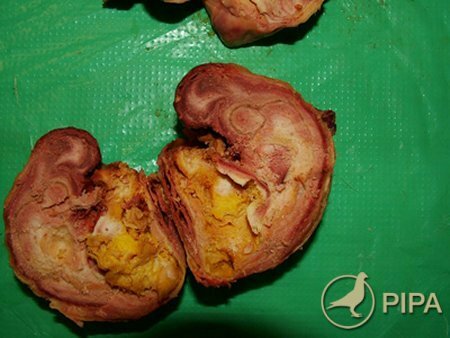 Oddly, it seemed like the embryo has already started to develop inside the body of the hen. Beyond the first egg I found an even larger second one in the oviduct. This egg did not even show the regular egg shape like the first one; its longer axis was strangely bended. Its shell was not calcified either, similarly to the first egg. When I carefully cut it in half, exactly through the longer axis, what I found was a shocking experience. In this second large egg we found an almost completely developed chick. The picture clearly shows a partially absorbed yolk around which is a typically positioned embryo. Its head, the cranium, even the shape of the beak are clearly visible, as well as the backbone and the whole body. Even the impress of the umbilical chord which connects the embryo to the yolk is visible. Trying to find an explanation to this unusual case we probably found the cause as well. On the sternum of the bird were signs of previous injuries. This indicated that the bird had an accident lately; maybe fell down to the ground or hit a sharp, solid object. It is conceivable that the accident caused injury in the oviduct as well, rendering it incapable of building a calcified shell around the first egg and of passing it on. Then, the second egg developed which became even larger than the first one, and got stuck in the oviduct behind the first egg. The two eggs could not get out of the bird’s body but they did not kill the bird. This is why there was enough time for them to start developing inside the pigeon’s body. Getting philosophical and thinking this case further, we can easily end up with interesting assumptions. If, by chance, the hen would have finally been able to lay the eggs and the chicks would have been healthy, they should have hatched way before the end of the normal incubation period giving the breeder a hard time to figure out what happened. Or even further, what a surprise could have been if the hen would have given birth of two live chicks! Zsolt is a real good doctor Always very good advices !